My first bake of the year 2016! No-Bake Baileys Chocolate Biscuit Cake. Chocolatey rich & simply irresistible. A slice of simple goodness. I simply love the slight tint of Baileys within the biscuit cake. Such a sweet & delicate flavour and it goes perfectly well with the rich & creamy chocolate ganache. I am so going to dig into another slice right now! How about you? 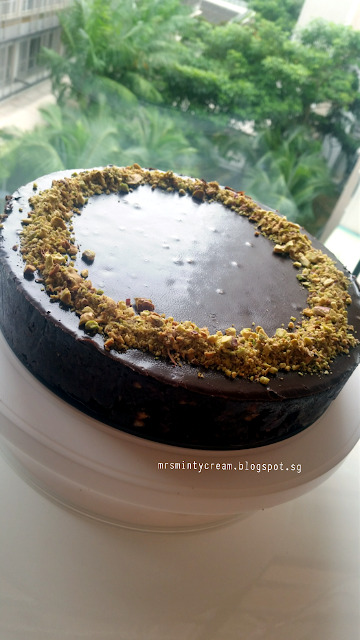 If you are looking for a twist to your usual decadent but boring chocolate cake? Try this! The crunch coming from the digestive biscuit base along with the nutty flavour from the almond and pistachios nuts - Yummy! 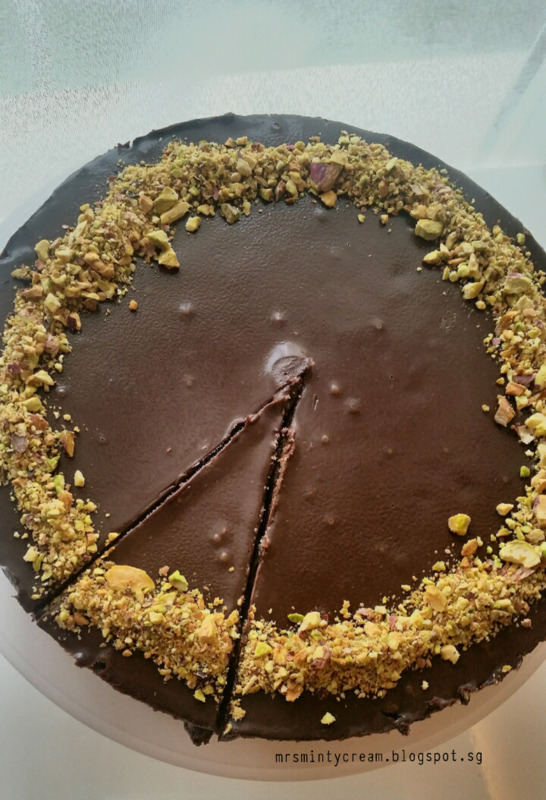 Not to mention, my favourite of them all - The deliciously rich & creamy chocolate ganache on the top of the biscuit cake! Yummy Yummy Yummy! From other similar recipes online, you will realise that many others also made similar version of this cake using Marie Biscuits instead. But personally, I prefer the crunch of the digestive biscuits in this case and feel that it goes really well with the pistachios nuts. It is a matter of personal preference I guess. To be honest, I wasn't counting on this recipe to be a huge success due to its simplicity. 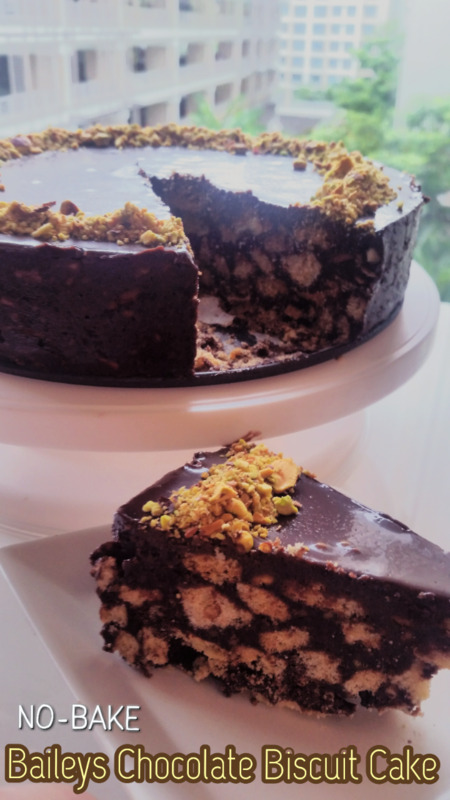 But to my surprise, it is really well-received in my family and even I (not much of a sweet tooth) enjoys the rich and creamy chocolate ganache alongside with the nutty biscuit cake base. You got to try it to believe it! Recipe: Adapted & modified from Home Cooking Adventure. 2. 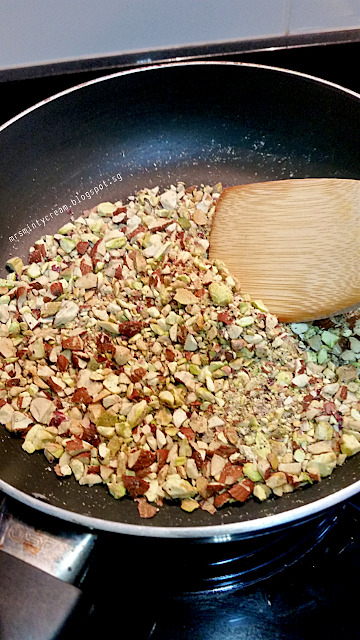 In a saucepan, over medium heat, toast the mixed nuts for 5 minutes. Stir frequently to ensure even toasting. Set aside for later use. 3. 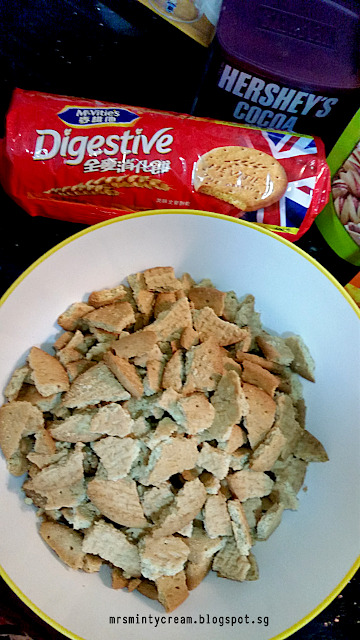 Break digestive biscuits into small pieces in a large bowl. 4. 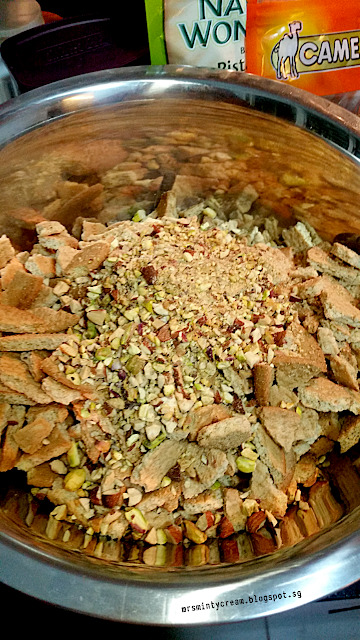 Add in mixed nuts (Step 2) to the digestive biscuits (Step 3). Mix well. 5. In a saucepan, combine sugar, cocoa powder and milk together. 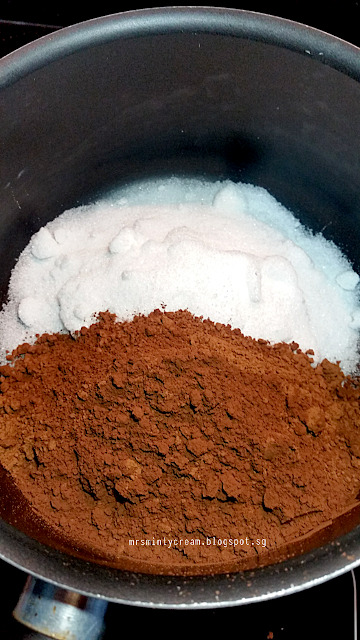 Mix well to ensure that the mixture is well-mixed. 6. Place saucepan over medium heat. 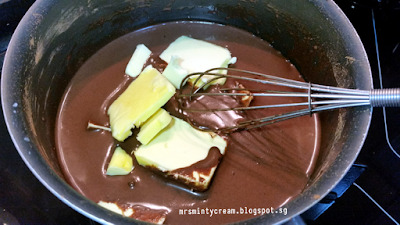 Add in butter and bring mixture to a boil while stirring constantly. 7. Remove from heat and add in Baileys and vanilla extract. Mix well and allow chocolate syrup mixture to cool for at least 15 minutes. 8. Once chocolate syrup is cooled, pour it over cake base mixture (Step 4) and ensure they are well-combined. 9. 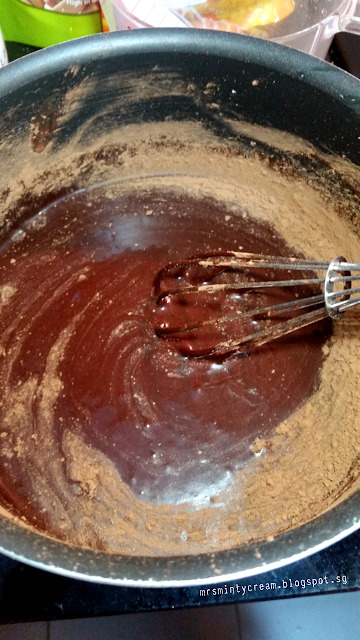 Transfer combined cake base mixture into cake pan and press down firmly using spatula (or back of a spoon). 10. Cover with cling wrap and refrigerate for 1 hour. 11. After 1 hour, heat whipping cream in a saucepan over medium heat until it starts to boil. 12, Pour hot cream over chopped chocolate and stir well. 13. 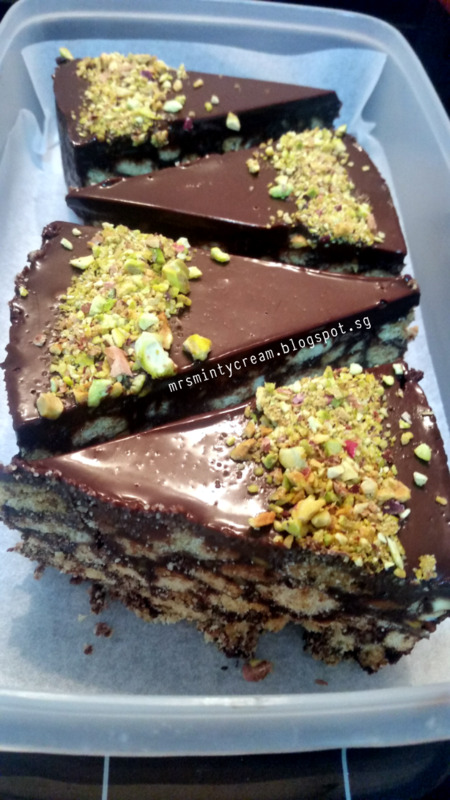 Remove cake from refrigerator and pour chocolate ganache over cake. 14. 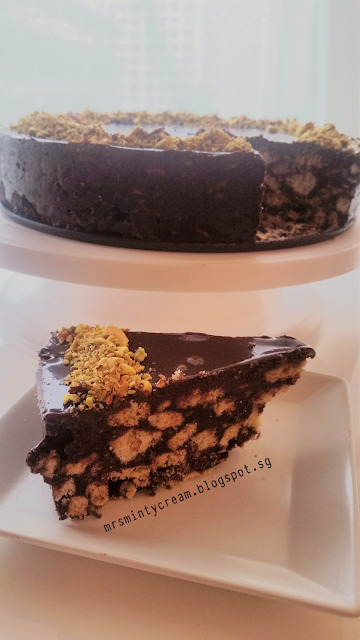 Refrigerator chocolate biscuit cake overnight before serving. 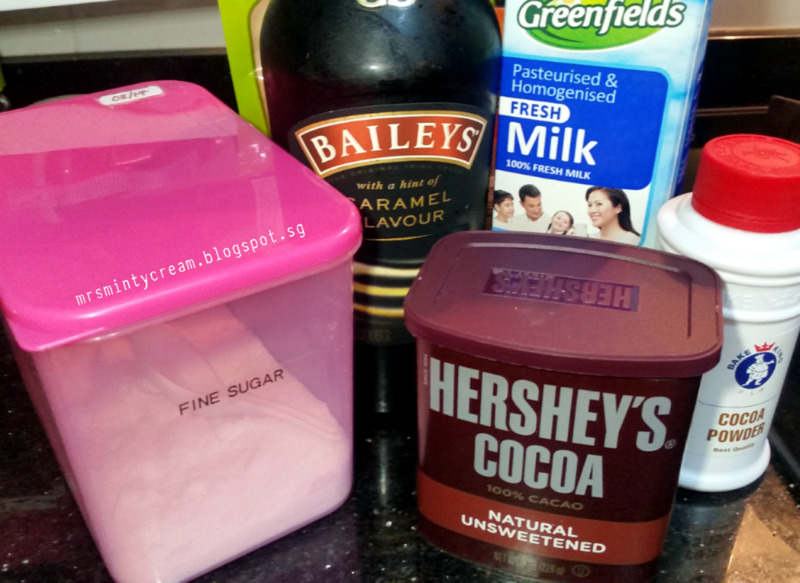 Chocolate and baileys is a lovely combination. I usually have it in cocktail form, but I'm sure I'd enjoy it just as much in a cake!! This looks incredible! And it is no bake?! I have to try this recipe! Yes dear, totally no bake. 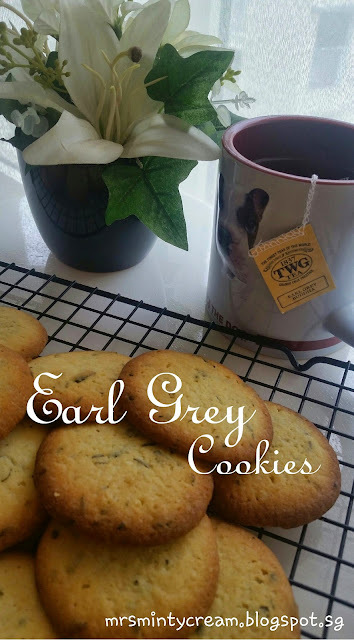 Easy recipe with simple preparation work. Have fun trying it out! This cake looks amazing I am drooling!! I love that it is no bake too! Your cake looks so chocolately rich. 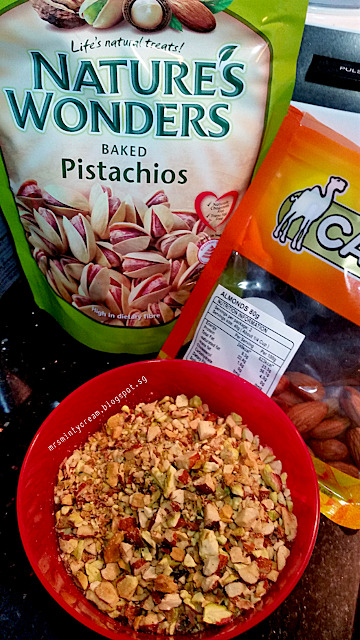 I love the addition of the pistachios. It must add a wonderful crunch. And you certainly can't go wrong with adding Baileys. Pistachios is one of my favourite nuts and I try to incorporate it into as many recipes I can. Haha! Love the idea of biscuits cake. And, pistachios are my favorite. Your cake looks so rich! I'll try to make it soon :). They are my favourite too! Happy to know that you will be trying it out soon. I would love to see your version of the cake. Tag me if you do try it out ok? 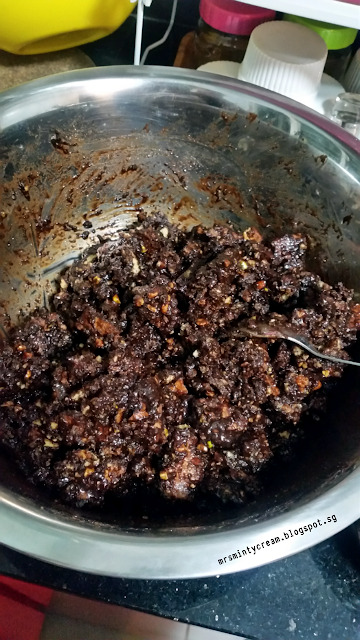 It is indeed very rich and delicious. So rich that I feel so sinful after one FULL slice of it. Yummy!